We life in a fast world and a visual world. Information is consumed anytime everywhere. Information and with it knowledge has become one of the worlds resource. The battle around it is mainly about the visualisation. In a stunning publication Nai Publishers have dedicated a book to one of the founders of our contemporary understanding of visualisation. Don’t worry if you haven’t known him before very few actually have. His name is Otto Neurath. The book with the title ‘Otto Neurath – The Language of the Global Polis‘ by Nader Vossoughain tells the story of this Austrian sociologist who did not fear any topic or occupation to follow his interest. Neurath is an incredible vital and versatile scholar, practitioner, politician, theoretician, developer or craftsman. What we maybe don’t know is his work, but remarkably it feels somewhat familiar, as if we’d known it. 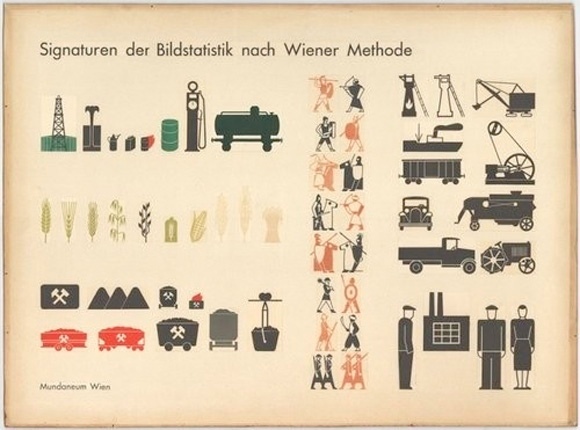 Image by Otto Neurath, taken form gis and science where you can find a collection of Neurath’s illustrations. The publication is in the tradition of Nai publishers a truly nice designed piece and it has this surprising twist to it, it is a hardcover but in the form of a paperback, I love it. The book redraws Neurath’s life along his work and engagements. It puts a special focus on his collaborations with well known figures of his time, such as Le Corbusier or Corneis Van Eesteren. The later’s work was also currently published by Nai Publishers in the book ‘The Functional City‘ also reviewed on urbanTick (1, 2). The author has chosen to structure the book along three major topics under which Neurath’s work can be organised, community, democracy and globalism. It gives a good sense of the broadness of Neurath’s work and involvement. However it can be confusing as this structure is not chronological, but the content is still based on his life. So duplication and repetition can no be avoided. Nevertheless this also has an upside and can for the observant reader lead to some hidden ‘Pulp Fiction’ moments, were the same situation is seen from different vantage points. Image by Gerd Arntz u. Otto Neurath, Collection International Institute of Social History, Amsterdam taken from artnews / Mengenvergleiche. The title of the book basically already hints at most of the aspects of Neurath’s work. The ‘language’ points to Neurath’s work on a ‘language of symbols’ making knowledge and information accessible to all and with it empowering everyone to take part in social and political discussions and decisions. ‘Global’ has to be read in the sense of everyone, Neuraths vision as described in the book at a number of occasions really was to reach everyone, especially making data accessible to underprivileged groups of society. ‘Polis’ finally summarises Neurath’s interest for the city, settlement or aspects of spatial organisation of society in general. This is, as you have guessed, at the same time summarised the three chapters in a nutshell. But be aware the book is a lot richer and if it were a thriller the many twists and bends would be highlighted. And really this is what it is, because it is modelled on Neurath’s life there are jobs and projects that just didn’t work out, especially in connection with the war and other dramatical political changes in Europe at the time. Neurath seemed to have been involved in almost all of them. So don’t miss the section with his detailed biography that is attached towards the end. Together with the index, a section on detailed notes and epilogue a this is a publication that leaves little to desire. 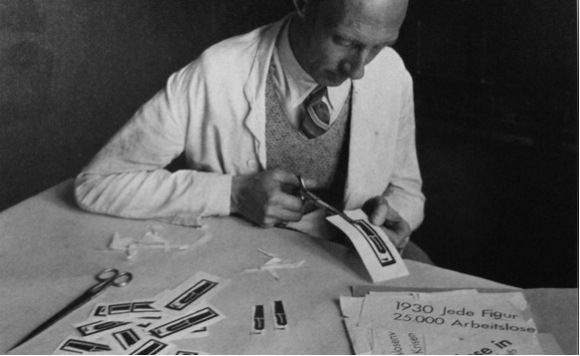 In 2008 there was also an exhibition at Stroom den Haag on Otto Neurath curated by Nader Vossoughain. A lot of the content i still accessible on line, including a video interview with the curator. The modern day version of Neurath’s icons or isotyes can be for example found at AIGA, the professional association for design, at the Isotype Institute or seen in use for a chart visualising the war in Iraq by the NYTimes. As seen, still today, some will claim even more so, the visualisation is the very big topic. Together with the computer and finally with the internet increasingly unbelievable amounts on data a created, recreated and shared. Large collections only now with the contemporary technology become accessible. Recently the public claimed successfully to free data sources and open them up for public access, e.g. data in the UK and London specifically –London data store. Not that the general public can handle or understand all this information but currently they have the power to put on enough pressure. But globally visualisation is the hot topic. In all areas but also specifically in politics a traditional field of facts argumentation. Vossoughian, N., 2008. Otto Neurath – The Language of the Global Polis, Rotterdam: NAi Publishers. Great review, thanks for highlighting this. 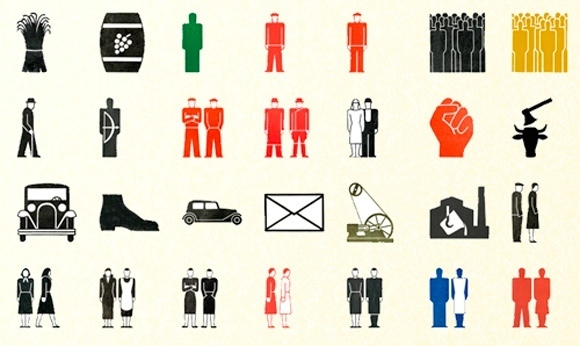 The book redraws Neurath's life along his work and engagements.